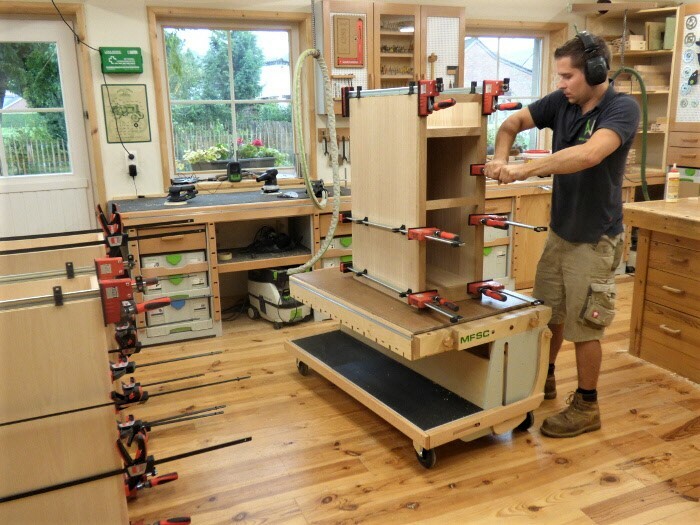 This custom built shop cart from Belgian furniture maker Timothy Wilmots is a height-adjustable assembly table, a glue-up table, a panel cart, a Festool-inspired dog-hold bench, a drying rack, and a mobile shop cart - all in one. 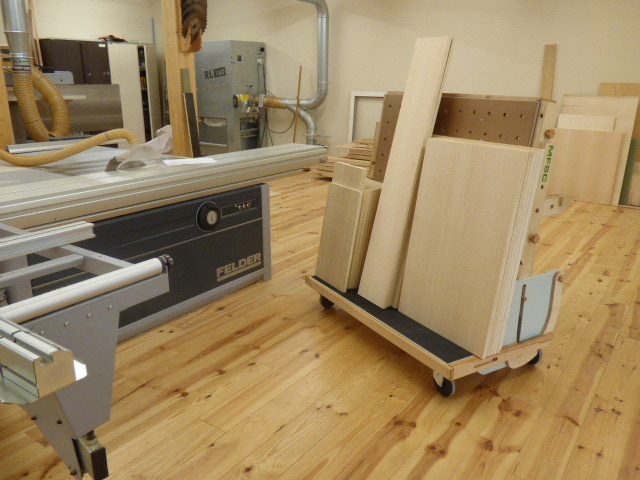 Wilmots began building the MFSC (Multi-Function Shop Cart) three years ago, seeking a mobile shop fixture "designed to assist woodworkers all along the construction of a piece of furniture, from the first to the last step." "All these designs exist and can be made/bought," Wilmot writes. 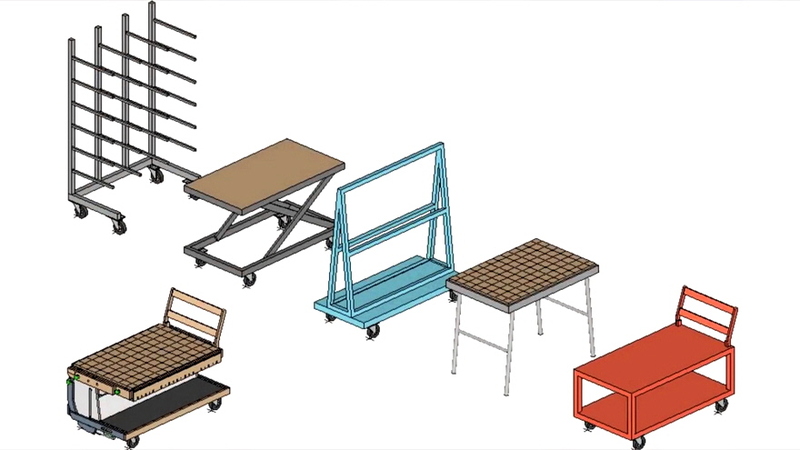 "But in my production oriented shop I would have needed two of each to be really useful, that would have cost a fortune and I didn't have the room anyway because then we're talking about at least 10 different carts/workbenches." 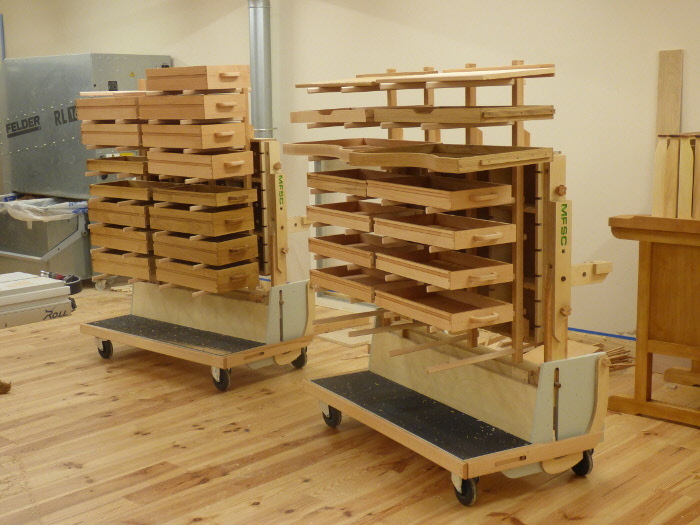 While working in my workshop I encountered several problems that were slowing me down or causing frustrations, such as the need for a cart to move around parts from tool to tool, the need for a height adjustable assembly table, the occasional need for additional work benches or the need for drying racks. For most of these problems, there are commercial solutions, but these are costly and would have filled my workshop while only being used periodically. So about three years ago in 2014, I had the idea to design a single cart that would solve as much of these problems as possible. 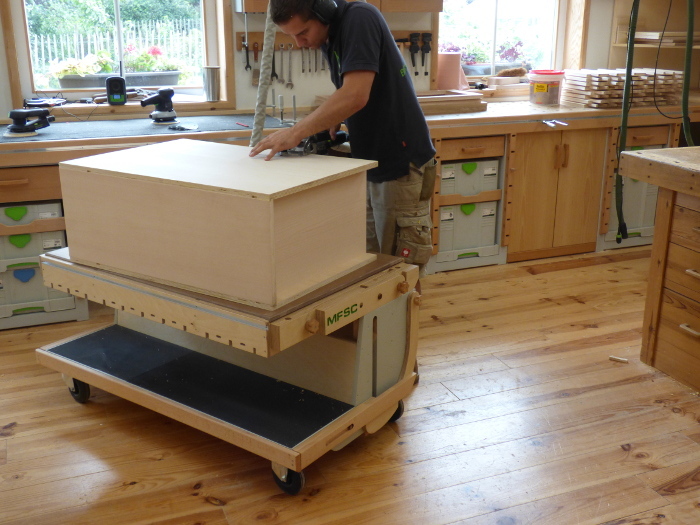 It had to be a workbench, a wheel cart, a rack and adjustable in height. As soon as I started drawing a prototype, it became clear that combining these apparently simple functions in a solid and reliable manner would be extremely complicated as nobody had ever done this. I went through numerous different designs and approaches, but always encountered technical problems or unacceptable compromises. This project stayed in the back of my head for years, and I noted down and tested each new idea that came up, but it was only in the summer of 2016 that I found a way to solve a major issue that was blocking all progress, mainly the side arm design. From then on things sped up, I built a prototype before having finished the design of the lift mechanism. Many other problems showed up, mainly finding a way to operate the lift mechanism easily, and taking away play. This took a few more weeks to solve, but eventually every problem was solved and I built 2 final models straight away in August 2017 for myself, and have been using them since. One of the major features for me is the ability to do assembly work on it at an adjustable height, gone the days of working on your knees. This was really missing from my workshop as I either had the floor or the top of my assembly table, nothing in between. But again an adjustable assembly table is something all woodworkers need, but only during a specific stage of the fabrication. Most of the time it would just sit in the way. The MFSC was a great opportunity to incorporate a feature I thought of when using my Bessey KRV clamps with the little support blocs that hold them upright. 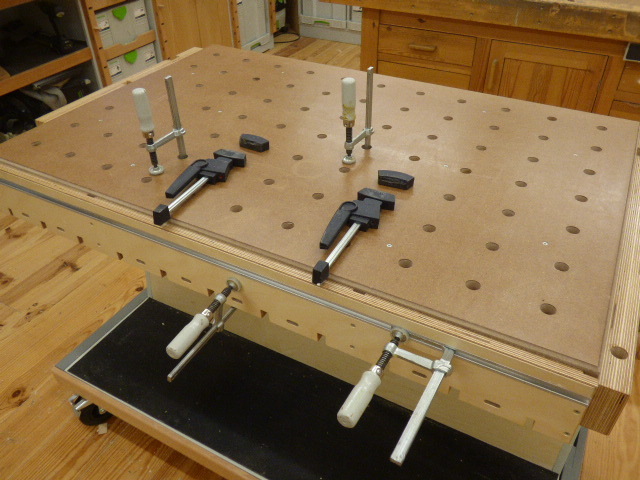 I thought of building a table with similar notches that would hold the clamps, but again, a table that does only that would be a waste of space most of the time. 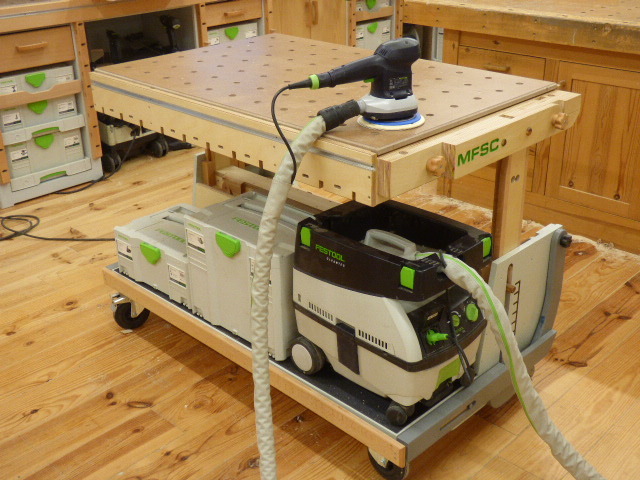 Here I decided to incorporate this into the flip side of the MFSC, up to then I would - like most woodworkers - do my clamping work on top of my main workbench. This creates several problems, the first is that it renders the workbench useless as long as the glue hasn't dried, and second, the glue would drip on my workbench and create a mess. 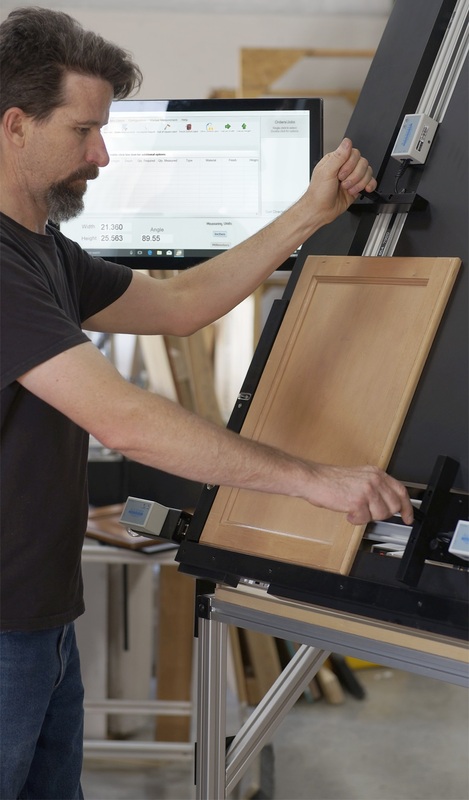 Doing this on the flip side of my MFSC's solves this, I can do twice as many glue ups and still keep my main workbench free, I can roll them away and let it dry much longer while keeping the workspace free. Also, glue drippings don't matter anymore as they fall on the underside of the work top. Initially, I wanted to insert sticks directly into the table to use it as a rack, but that would have made it too limited in capacity, so I designed these perforated stiles that lock onto the table and can be spaced randomly, they also store inside the MFSC along with the sticks. 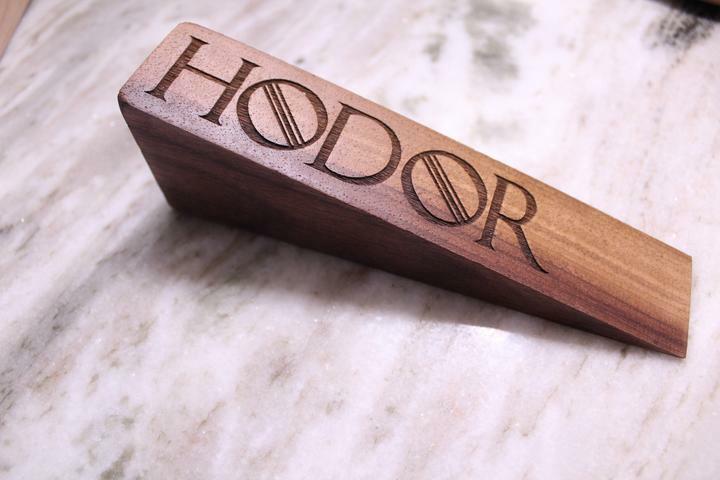 Again this is something every woodworker needs at a particular moment during the fabrication. Before I had these I would just place all these parts on all my worktops and on the floor. I would plan these operations for the end of the day because the workshop couldn't be used for at least 10 hours after. I could have bought/made similar racks but just look at the space they take. Wilmot has more information listed here.